Safety, Health and Welfare at Work (Construction) Regulations 2006 (S.I. 504 of 2006). Safety, Health and Welfare at Work (General Applications) Regulations 2007 (S.I. 299 of 2007). 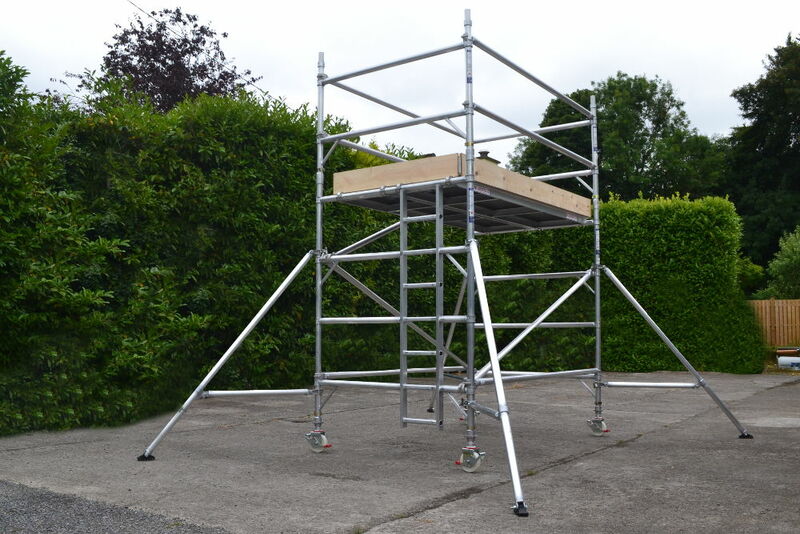 A safe stable tower which can be built using the 3T (through the trap) method and is suitable for all industrial applications in Ireland. Internal ladder and hatch for the safety of the operator. 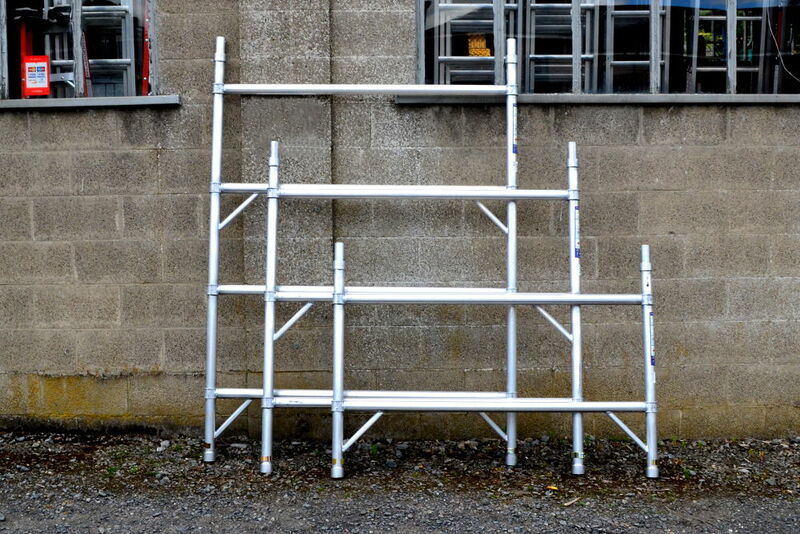 These scaffold towers are available in single 850mm and double 1450mm widths and are also available in 2 different lengths 1800mm and 2500mm. a total of nearly 40 feet. As a responsible vendor we are aware of our statutory obligations in relation to providing both documentation and information with any tower we sell. Available in 1800mm length and 2500mm lengths. Available in Single Width 850mm and Double Width 1450mm. 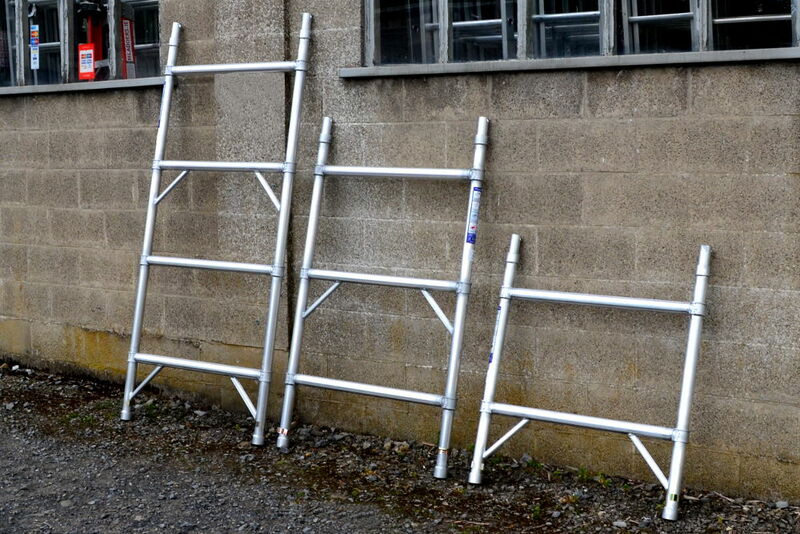 Available in platform heights from 1.2m to 12.2m (Larger heights are for internal work only). Smooth and ribbed tubing on braces for quick identification. Choice of toeboards, standard wooden or new aluminium folding unit. Fully complies with latest regulations, product standards and requirements – including the 3T method of assembly. Dual brake on/off system on each of the 4 x 150mm castors. Large, articulated rubber feet on all stabilisers. 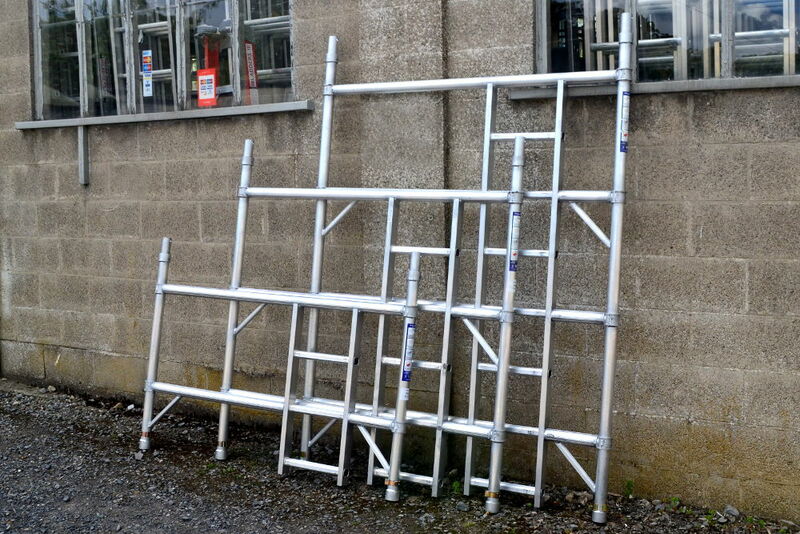 Wide ladder with hexagonal rung for easier climb & additional safety. 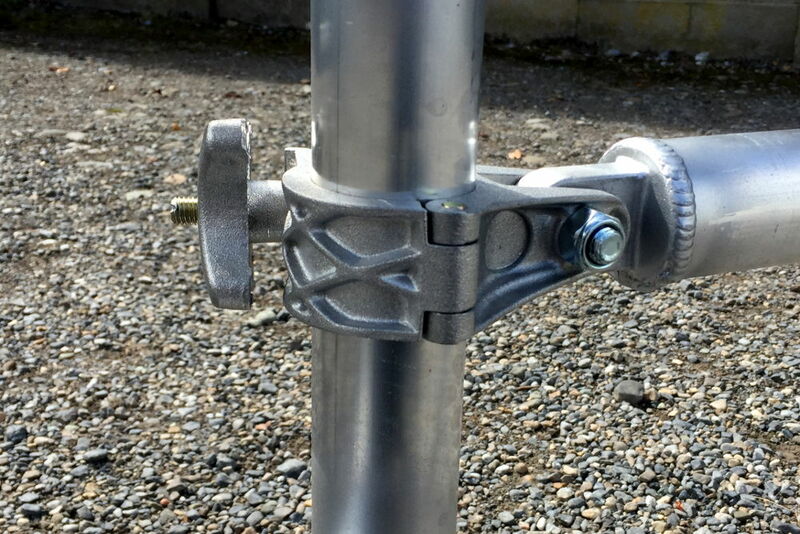 Quick release pull rings with stainless steel pin on all bracing. Tested & Certified to BSEN1004:2004 – Class 3. The highest Standard possible. Extruded tube thickness of 1.6mm. Some competitors are using as little as 1.2mm thick tubing. Tubing is welded NOT crimped. Extruded tube diameter of 50.8mm. Spring Steel lock clips on each tower frame. 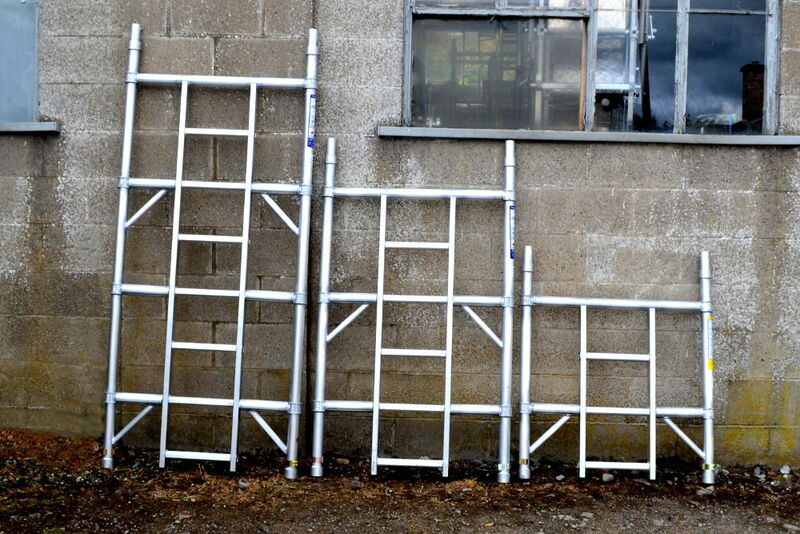 Extruded Aluminium Ladder Stile and rung. The ladder section is an integral part of the frame.